Published on January 23, 2016 by Martyn. Be the first to comment! 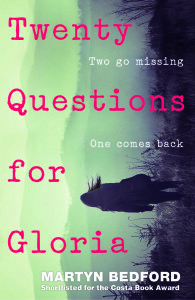 More exciting news dropped into my inbox this week with the announcement that Twenty Questions for Gloria has been selected by Apple as a Best Book of the Month for February. It means my new teen/YA novel will feature prominently on Apple’s hugely popular iTunes and iBooks sites throughout next month, giving it terrific exposure to potential readers. It should also guarantee that both of my teenage daughters are aware that their dad has a new book out.